Racino on a track to nowhere? Last week's strong DFL gains in the Minnesota House could imperil GOP plans to boost state revenues with gambling dollars. Gov. Tim Pawlenty and top Republican legislators have been pushing for a state share of Native American casino funds -- and they turned the matter into a last-minute campaign issue this year. But the post-election landscape now makes it seem less likely that gambling proposals will advance. 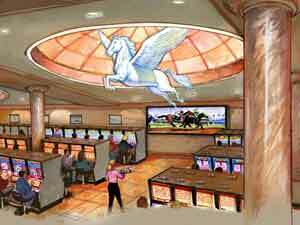 St. Paul, Minn. — Two years ago, House Republicans approved a plan for a "racino" by authorizing slot machines at the Canterbury Park racetrack. But since then, 18 members who voted for it have retired or were defeated in last week's elections. In the new landscape, House Speaker Steve Sviggum, R-Kenyon, will have to entice DFLers or his own anti-gambling Republicans to join him if he hopes to repeat the racino victory. Faced with the new reality, Sviggum says he's not ready to put gambling at the top of the caucus wish-list. "I don't want to step too far in advance as to what our agenda will be," Sviggum said. "I personally happen to favor competitive gaming. The citizens of Minnesota favor competitive gaming, or getting a fair share of the gaming dollar." Minnesota's Indian tribes uniformly opposed the racino, as well as several other options for expanding casino-style gambling in the state. John McCarthy of the Minnesota Indian Gaming Association says the Sviggum's options are now more limited. "The speaker does not have a huge truck that he's driving anymore," said McCarthy. "He has a very small Volkswagen now. He needs to get every single vote. And he's also going to need to work more closely with the Democratic minority." McCarthy says even though the balance has shifted, he believes Sviggum and Gov. Pawlenty will continue to push the issue to score political points. Pawlenty and Sviggum argue that the current compacts, which provide for no state share of Indian gambling revenues, are unfair. Pawlenty has called for the tribes to contribute 25 percent of their net gambling revenues to the state -- a figure he estimates to be worth $350 million annually. Pawlenty has said that if tribes don't agree, he'll consider inviting private casino interests to set up shop in Minnesota, competing with the tribes and giving the state a bite of the gambling industry. But the new legislative landscape makes it more difficult for Pawlenty to cobble together the backing needed. Bill Thompson is a professor of public administration at the University of Nevada Las Vegas, who's studied tribal casinos. He says if lawmakers aren't backing up the governor, tribes will perceive the threat of competition as a hollow one. The speaker does not have a huge truck that he's driving anymore. He has a very small Volkswagen now, and he needs to get every single vote. "The Indians have absolutely no reason to sit down," said Thompson. "And if there's serious consideration about a Mall of America casino, you can bet that the Mystic Lake people are going to have so much lobbying money in the Legislature against it." Many tribal leaders say they're growing increasingly frustrated by attempts to tap into the gambling market. Tadd Johnson represents the Mille Lacs Band of Ojibwe, which operates Grand Casino Mille Lacs and Grand Casino Hinckley. He says the governor's recent move to secure gambling profits -- combined with a flurry of Republican campaign ads centered around Indian gambling -- have poisoned the well for future negotiations. "Basically he held a gun to their head and said, 'Either we talk and you cough up $350 million, or I'm going to open a casino in the Twin Cities,'" Johnson said. "So his approach has not been terribly delicate or respectful." Three Minnesota tribes, however, remain in what they say are hopeful discussions with Pawlenty's office. The White Earth, Red Lake, and Leech Lake Bands together account for more than three-quarters of all enrolled tribal members in the state. They're seeking a partnership with the state to open an off-reservation casino in the metropolitan area. Pawlenty has indicated a willingness to discuss the plan. And he says that, despite election-year turnover at the Capitol, gambling proposals remain on the table. "While the faces may change at the Legislature, this remains, I think, a significant issue to the voters of Minnesota," Pawlenty said. "We're going to continue to pursue it." Pawlenty is scheduled to meet with the three northern tribes early next month to continue discussions. Prior estimates indicate the state could receive roughly $100 million annually from a state-tribal operation.